I've played a number of games, both old and new, but this may be the oldest. Originally released in 1981, Ultima I was the first in what would be a 9-part series of computer RPGs. I own the first seven, and have been planning to play through them in order. 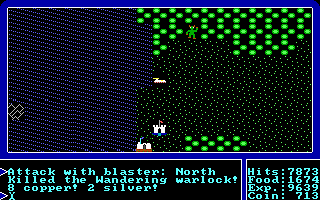 Since I recently got Ultima I running via dosbox on Elementary, I decided to make it this week's game. 1. Find a castle, and get a quest from a king. 2. Go to a nearby town to stock up. 3. Either go find the landmark specified, or kill some specified monster deep in one of the game's many dungeons. 4. Return, pay the king for healing, get your reward, and depart. Doing this, you get the items needed to use the time machine to return to the past and defeat the evil wizard Mondain. There's more to it than that, but that's the general idea. But what was that about a time machine? In reality, this game is an interesting blend of Sci-Fi and Fantasy. While most of the game is fantasy, with wizards and orcs and such, there are also aliens and spaceships. Heck, there's even a flying car you can buy! Back to gameplay, the game actually features a fairly large open world to explore, packed with castles, towns, dungeons, and mysterious landmarks. The dungeons themselves are not too large, but there are many and their layouts are unique. Speaking of the dungeons, you will get lost in them without making detailed notes of their layout. They feature many twists and blind corridors. When an enemy attacks you in one, you also have no idea which direction it's attacking from. You may get hit several extra times just trying to find them. Stat-wise, health is the only noticeable part of character growth. In fact, oftentimes I level up without even noticing at all! Unfortunately, Ultima I's graphics have not aged well, especially in dungeons. I realize that the limitations of the time required these more archaic graphics, but some of them look really awful. This shouldn't influence whether you play the game or not, but just be aware of this. 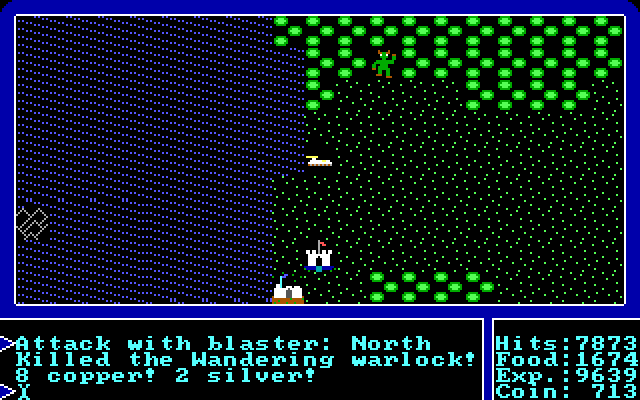 You should be aware that in its' age Ultima I is a very different RPG experience than what you're probably used to. With that in mind, this game can be a ton of fun with a pencil and a stack of graph paper. I recommend that you find a site with some general controls and explanations of how the game works before playing for the most enjoyable experience. You can buy the first three Ultima games together here.